We all know that basically the best thing about Thanksgiving is the leftovers. And while we’re all for putting together a plate and throwing it in the microwave, that gets a little old after awhile. 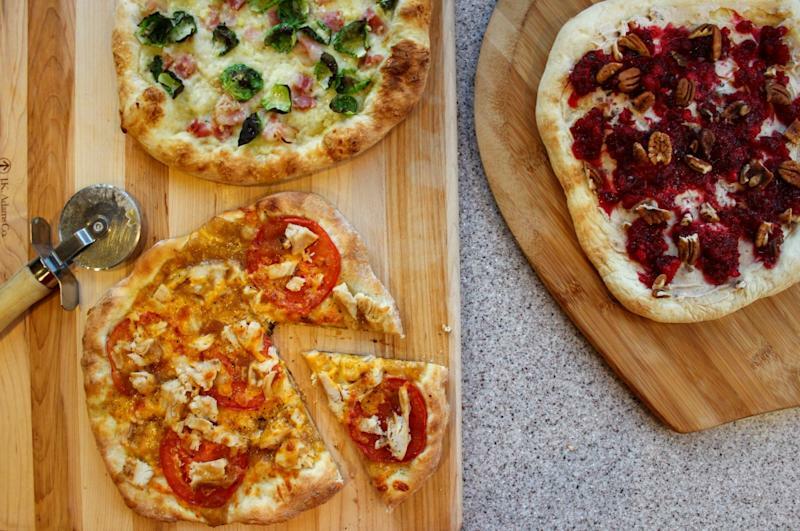 This year, transform those leftovers into another fan favorite — pizza. This will especially come in handy as you hunker down to watch all football, have all the kids’ friends over to watch Christmas movies, or come home from a busy day of Black Friday shopping. Here we offer three recipes so there’s something for everyone. Kids and adults alike will love the Turkey-Cheddar combo. The Brussel sprouts and mashed potatoes can easily become vegetarian — just ditch the bacon. And the cranberry-pecan pizza makes a fun and unexpected dessert. Allow dough to rise according to package directions. Heat oven with pizza stone to 500°F. Form dough into a 12-inch circle. Sprinkle cornmeal on a pizza peel and place dough on top. Scatter ½ of the cheddar on top, followed by the tomato slices and shredded turkey. Dollop gravy on top. Sprinkle with the remaining 2 tablespoons cheddar. Transfer pizza to the stone and bake at 500° for 5 minutes. Check to make sure pizza is not burning; continue baking until dough is lightly browned. Remove pizza from oven and season with pepper. Form dough into a 12-inch circle. Sprinkle cornmeal on a pizza peel and place dough on top. Carefully spread mashed potatoes on the dough. Scatter garlic, bacon and Brussels sprouts on top. Sprinkle with the cheese and drizzle with the olive oil. Transfer pizza to the stone and bake at 500° for 5 minutes. Check to make sure the pizza is not burning; continue baking until dough is lightly browned. Remove pizza from oven and drizzle with more olive oil if desired. Form dough into a 12-inch circle. Sprinkle cornmeal on a pizza peel and place dough on top. Transfer pizza to the stone and bake at 500°F for 5 minutes. Check to make sure the pizza is not burning; continue baking until dough is lightly browned. Remove pizza from oven and cool slightly. Spread cream cheese on top, then dollop with cranberry sauce. Scatter pecans on top.